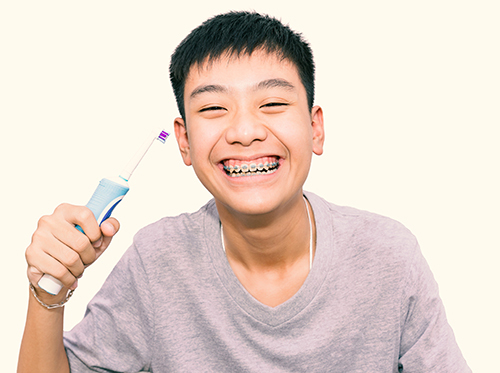 Proper oral hygiene techniques are always worthwhile, but they are especially crucial when you’re wearing orthodontic appliances such as braces. When you don’t maintain an effective oral hygiene routine, you can be more susceptible to gum disease as well as tooth decay, cavities, decalcification, discoloration, and/or staining of the teeth. Braces themselves don’t cause these issues, but since they create spaces that are difficult to clean, they provide extra sources of food (dental plaque and food debris) for the bacteria that do. Bacteria create a biofilm on the surface of a tooth that can spread if not addressed. That bacteria food can only be removed by a mechanical action: brushing and flossing your teeth! Proper tooth brushing technique: Make sure to brush your teeth thoroughly (for a total of about two minutes), but not too hard. Point the head of the toothbrush at the gum line and brush just hard enough so that you feel slight pressure against the gums. Use a soft, small-headed toothbrush or an electric toothbrush if you’d like. Try your best always to clean on and around every tooth, bracket, and wire in your mouth! Flossing: Braces can make flossing a chore, but it’s an essential adjunct to proper tooth brushing. Make sure to floss between all your teeth and brackets. Dr. Anna Salas can provide you with braces floss threaders and interproximal toothbrushes (small brushes used to clean areas under wires and between brackets) to make the task easier. You might also consider purchasing an oral irrigator that uses a stream of water to blast food particles and debris from between teeth and gums. Rinse with water: This may sound slight, but it’s a good idea, especially if you aren’t able to brush. Rinsing your mouth with water throughout the day helps to dislodge the decay-causing food particles that become lodged in braces. Hygiene away from home: It’s a good idea to have a kit with a toothbrush, floss, floss threaders, mirror, and small water cup on hand at school or work. That way, you’ll be sure to have all the tools you need to keep your mouth clean. Regular professional cleanings: As always, it’s best to visit your dentist regularly to verify everything in your mouth is in order and your oral hygiene routine is effective. Twice a year is sufficient, unless the dentist recommends more frequent visits. It's vital to keep your teeth and gums clean during your braces treatment, and that requires your care and attention. If feel like you need help with any of the techniques above, a member of our Houston, TX team can demonstrate them for you!